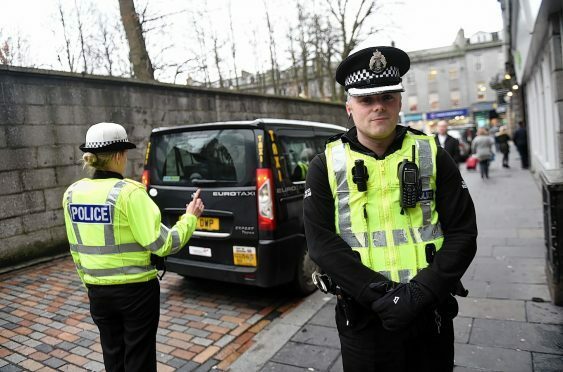 Police have carried out a city-wide inspection of Aberdeen’s taxis to ensure people keep safe over the festive period. Officers stopped and checked around 100 taxis and private hire cars during the two-day operation. The vast majority of vehicles were found to be legal, roadworthy and safe, with only a handful of minor offences detected. The joint road safety and licensing operation, which focused on official and unofficial taxi ranks, aimed to promote public and road safety and came as taxi drivers face one of the busiest periods of the year. Licensing inspector Kenny McGeough, said: “Taxis are the last piece of the jigsaw for getting people home safely. “We need to make sure we know who’s driving and these vehicles, which are doing a lot of mileage, are safe. “You or I could get into a taxi intoxicated at the end of the night and you would expect it to be safe. Drivers were asked to show their licences, prove lights were working and tyre pressures were checked. Insp McGeough added: “It’s what we expect – they’re professional drivers so I expect standards to be high. “They have a very positive attitude to us, they understand why we’re doing this.